Do I need another lamp? 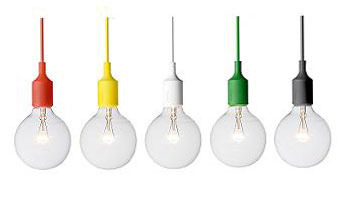 I love these E27 pendants, designed by Mattias Ståhlbomand. I love the colors and I love the fact that they are so colorful yet so simple. I am tempted to buy one of these even though I have no idea where I could us it. My resolution lately has been to only buy things after carefully planning and deciding where I could use the item. I do make exceptions for things that are absolutely fabulous…then I buy them even if I have no use or space for them! These lamps don’t get me that excited, so for now (sigh) I won’t be buying one. I will however keep scrutinizing each room to figure out where I could use a E27 pendant.